We caught a cab with a guy who spoke basically no English- Google Translate is your friend in that situation- but he saw the boxing picture and knew were to go. Very easy to get the tickets once you are there and there are some food and drink options available. We got the 2nd level option which I think was better than ground floor as we could see what was happening (3rd level has a fence to look through but really no different than the 2nd level so still good) Once the fighting started we got popcorn to watch the Thai’s betting (they get very into it- was almost as good as the fights). Was an awesome local experience. getting a cab back was a little problematic- not that there weren’t options just cabbies trying to con us- so make sure you know around how much it is and be prepared to haggle- we ended up getting a return trip for cheaper because we were willing to walk away. 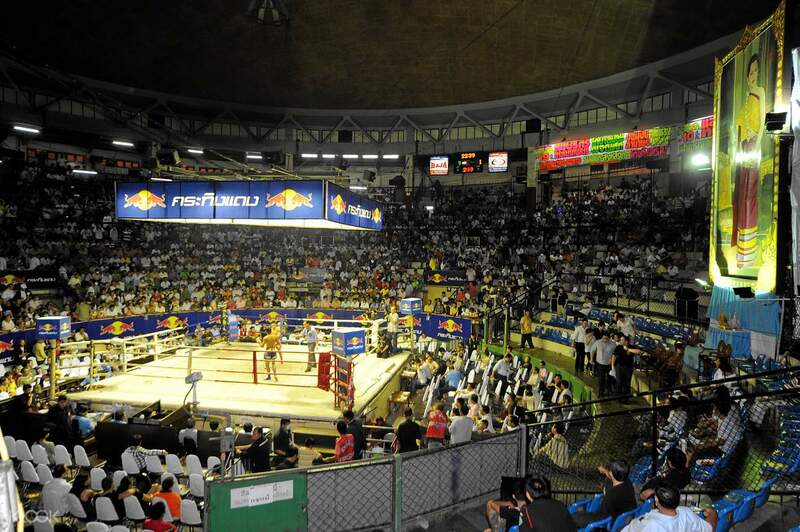 Experience the thrill of Thailand's action packed national sport at the Rajadamnern Stadium in Bangkok! 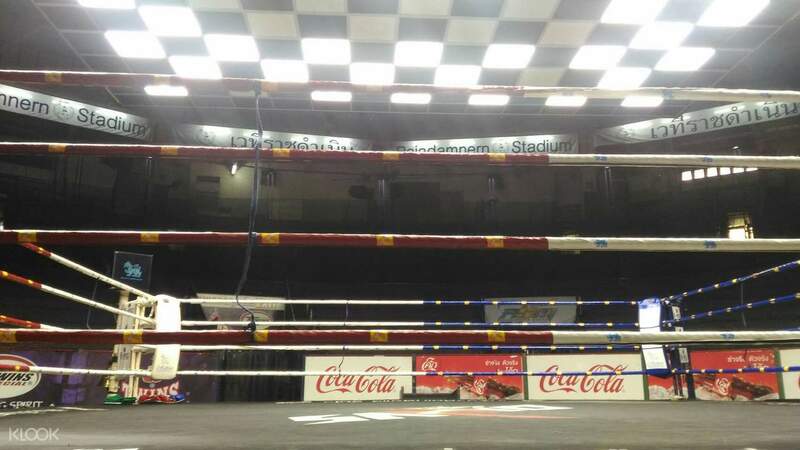 Even as one of the oldest and greatest Muay Thai stadiums in the country, the Rajadamnern Stadium still gathers throngs of Thai locals and foreign visitors alike for an exhilarating immersion in this traditional sport. 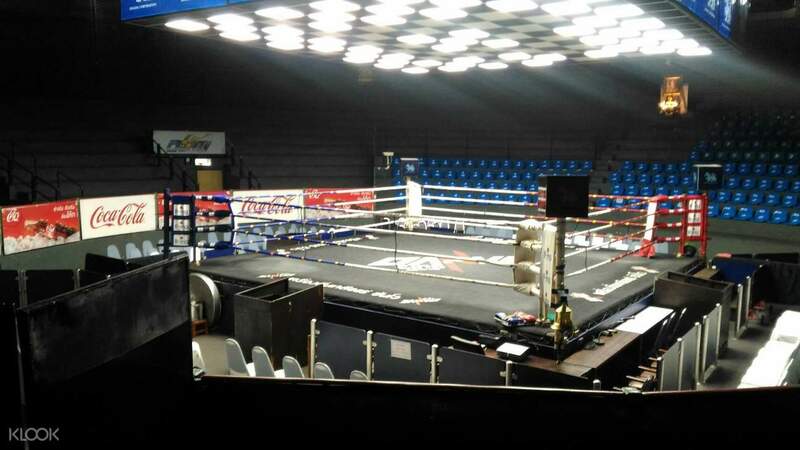 Get the best views of the 9 different matches from your ringside seats, or choose to sit among the locals betting on their favorite fighter at the 2nd or 3rd Class areas. Be one with the crowd as they cheer and roar and you'll understand how this age-old sport has remained popular over the years. 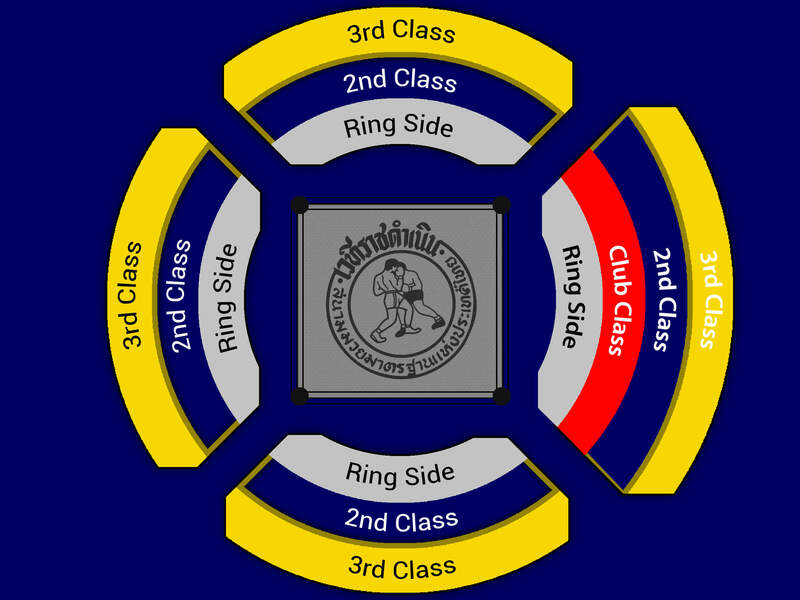 Choose Ringside seats for an immersive Muay Thai fight experience! Ticket collection was extremely easy at the Rajadamnern stadium. We arrived and proceeded directly to the ticket counter and were given our tickets and a coloured sticker to identify which area we were sitting in. We were then led to our ring side seats, there is a specific area of seats for e-ticket bookings. We arrived around 6.45pm and were sitting 3 rows back from the ring. The seats were comfortable and there were staff available to take drinks orders. We were able to take a rucksack in with us, they just do a search at the door as you aren't able to bring your own food or drinks. Drinks and food available in the stadium were reasonably priced. The fights were great, there was a good mix of tourists and locals watching. Ticket collection was extremely easy at the Rajadamnern stadium. We arrived and proceeded directly to the ticket counter and were given our tickets and a coloured sticker to identify which area we were sitting in. We were then led to our ring side seats, there is a specific area of seats for e-ticket bookings. We arrived around 6.45pm and were sitting 3 rows back from the ring. The seats were comfortable and there were staff available to take drinks orders. We were able to take a rucksack in with us, they just do a search at the door as you aren't able to bring your own food or drinks. Drinks and food available in the stadium were reasonably priced. The fights were great, there was a good mix of tourists and locals watching. It’s a great opportunity to have a well understanding about moay Thai boxing !!! It’s exiting and impressive experience!!! And it let me know moay is kind of repeat spirit sport !!! It’s awesome !!!! It’s a great opportunity to have a well understanding about moay Thai boxing !!! It’s exiting and impressive experience!!! And it let me know moay is kind of repeat spirit sport !!! It’s awesome !!!! The stadium is in a good, easy access location. Getting tickets was straight forward using the voucher on the phone. After that it’s just a great night of entertaining fights. The locals in the crowd can be just as entertaining as the fight itself too! The stadium is in a good, easy access location. Getting tickets was straight forward using the voucher on the phone. After that it’s just a great night of entertaining fights. The locals in the crowd can be just as entertaining as the fight itself too! Tickets were fast and super easy to get. There is a line for E-tickets and the stadium is in a very easy to get to location. Tickets were fast and super easy to get. There is a line for E-tickets and the stadium is in a very easy to get to location. Great place to go and spend some time. Great fights and some were very intense. Get 2nd class seats to truly enjoy. Great place to go and spend some time. Great fights and some were very intense. Get 2nd class seats to truly enjoy. Excellent up close experience! Ticket was easy to redeem at the counter (need to present your passport). Excellent up close experience! Ticket was easy to redeem at the counter (need to present your passport). So intense and fun to watch! (I’m 22F, came alone and had a great time) I recommend getting Class 2 seats. The most expensive ones don’t have a great view, since it’s lower and you need to look up at an angle (seems sort of like a tourist trap— all the frequent visitors and betters chose the Class 2 area) Definitely a must-see for Bangkok visitors! So intense and fun to watch! (I’m 22F, came alone and had a great time) I recommend getting Class 2 seats. The most expensive ones don’t have a great view, since it’s lower and you need to look up at an angle (seems sort of like a tourist trap— all the frequent visitors and betters chose the Class 2 area) Definitely a must-see for Bangkok visitors! Price is slightly cheaper than buying at Stadium (1000 tbht) for 3rd class. Collection is easy (present voucher or show QR code). Matches were exciting and fighters are impressive! Was a worth going experience. Did not feel like 4hours at all! Price is slightly cheaper than buying at Stadium (1000 tbht) for 3rd class. Collection is easy (present voucher or show QR code). Matches were exciting and fighters are impressive! Was a worth going experience. Did not feel like 4hours at all! Definitely get the second class tickets, the view was outstanding and the atmosphere of being next to the locals, who are making so much noise and gambling with each other ( I tried to work out how they could understand each other to no avail ) is just a once in a lifetime feeling. The fighters are great and it really doesn’t matter if you know much about the sport or combat sports in general, the skill level is huge. Saw 4 knockouts in one night which was a huge bonus and refreshments aren’t expensive (for an event, and by Bangkok prices) 150 for a large beer. Definitely get the second class tickets, the view was outstanding and the atmosphere of being next to the locals, who are making so much noise and gambling with each other ( I tried to work out how they could understand each other to no avail ) is just a once in a lifetime feeling. The fighters are great and it really doesn’t matter if you know much about the sport or combat sports in general, the skill level is huge. Saw 4 knockouts in one night which was a huge bonus and refreshments aren’t expensive (for an event, and by Bangkok prices) 150 for a large beer.